Kingdom Hearts III may have taken over 14 years to release but it was well worth the wait. Square Enix has a habit of developing highly anticipated titles for decades, with Final Fantasy XV and Kingdom Hearts III taking 10+ years to complete. Like Noctis' adventure, Sora's venture was worth the wait. Providing an epic journey through diverse worlds with amazing boss battles, Kingdom Hearts III rarely stumbles in its 40-hour journey. The long cutscenes and the lock-on system can become frustrating but these are minor issues for this masterpiece. Kingdom Hearts III may have taken over 14 years to release but it was well worth the wait. 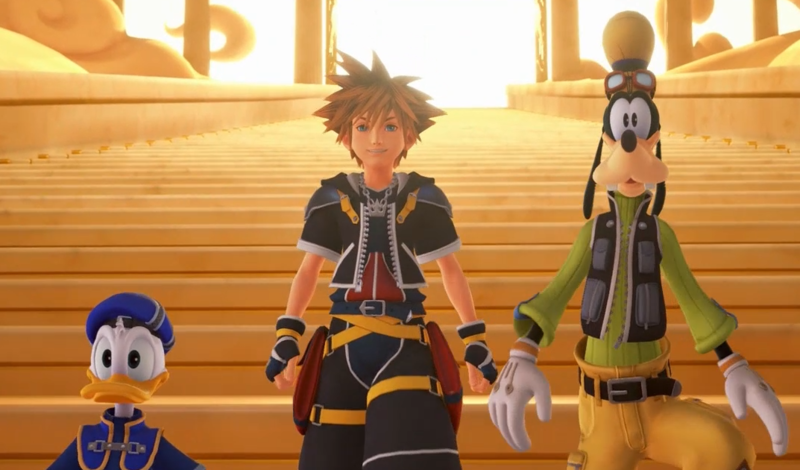 Kingdom Hearts III starts after Dream Drop Distance, with Sora drained of his powers following the Mark of Mastery examination. Sora must venture throughout multiple worlds to regain his strength and obtained the "Power of Waking" so he can take part in the upcoming Keyblade War that will determine the fate of light and darkness. Those without any knowledge of the Kingdom Hearts franchise will have a difficult time following the story as it is a complicated and densely crafted story. Square Enix has provided an extensive amount of information about key details about the world, both in optional menus and within the game, but you'll need to look up some information if you want to keep track of everything. This is an intricate narrative and even the characters poke fun at the absurd twists and turns during the adventure. The dialogue is hit or miss. It carries that traditional Disney charm, making references to love, hearts, and virtue as much as possible. However, some characters break these cheesy moments with a refreshing performance consisting of harsh language and condescending remarks. 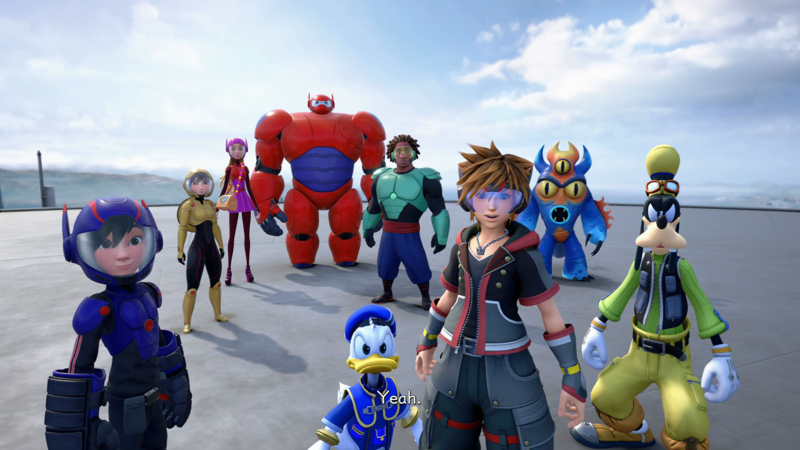 It's impossible to provide examples without spoiling critical story plots but these characters help give Kingdom Hearts III more heart. That being said this Kingdom Hearts title doesn't include any Final Fantasy characters, which is a disappointment. This was an intentional choice to put more focus on the original cast but considering that some of the past games had Final Fantasy characters playing critical roles in the story it seems strange to omit them from this chapter. Cloud, Squall, Tifa, and even Sephiroth played major roles within the past games. Seeing that newcomers Big Hero 6 and Elsa and Anna from Frozen were put into the game's narrative but someone like Squall, who explained to Sora what the Keyblade was in the first game and aided in multiple important battles against the Heartless and Organization XIII, wasn't is vexing. Combat and exploration are Kingdom Hearts III's best qualities. The combat uses a combination of momentum, movement, and countering to keep fights in a constant state of motion. By successfully hitting a target multiple times you trigger special attacks ranging from unique rides based on Disney attractions to specialized attacks linked to your keyblade or allies. Players can stack these abilities but they're on a timer to ensure players cannot horde these powerful attacks. Countering and guarding is still here, and given to the player earlier than previous games, allowing Sora to effectively defend himself. Square Enix has also put more emphasis on elemental resistance by having specific effects hindering Sora's movement if hit with certain attacks. Like hopping around if hit by fire, preventing you from attacking. Movement, like in Dream Drop Distance, plays a major role. Sora can parkour around the environment, including wall run on specific surfaces. Square Enix has reduced the damage from these movement based attacks since it was overused and exploited in Dream Drop Distance. It's still an effective tactic in both defensive and offensive tactics and used to reach high areas that contain treasures. But using these tactics during on-rail segments can be annoying since the targeting reticle feels a lot more floating than the reticle used for shooting during traditional combat which is strange. Square Enix has altered the keyblades used in Kingdom Hearts III to give the player more options. Instead of simply equipping the most powerful keyblade, each one has specific strengths and attacks without having drastic stat changes. You can switch between 3 pre-selected keyblades during combat and if you like a specific weapon you can further upgrade them using the synthesis shop. Donald, Goofy, and your guest allies can be outfitted as well with items and special equipment, similar to classic RPGs. Leveling has pretty basic here. You earn experience to gain levels that earn you action points that can be used for specific abilities. Every character has their own set of AP skills that range from extending combos to increased damage using specific magical attacks. Speaking of magic, players will have access to your classic fire, water, and ice-based spells along with special summons known as Links. Like your specialized combat moves, Links can be summoned for a specific amount of time but like past games summons mostly serve as flashy attacks since their damage pales in comparison to basic strikes. Square Enix has taken their time to ensure that each world has unique enemies based on the landscape like in past Kingdom Hearts games. Each world houses a combination of generic and unique enemies, for example, the Heartless in Pirates of the Caribbean is much more detailed than the enemies in Toy Story which are modeled after toys. Targeting these enemies can be a problem during close quarter fights, especially against flying enemies. 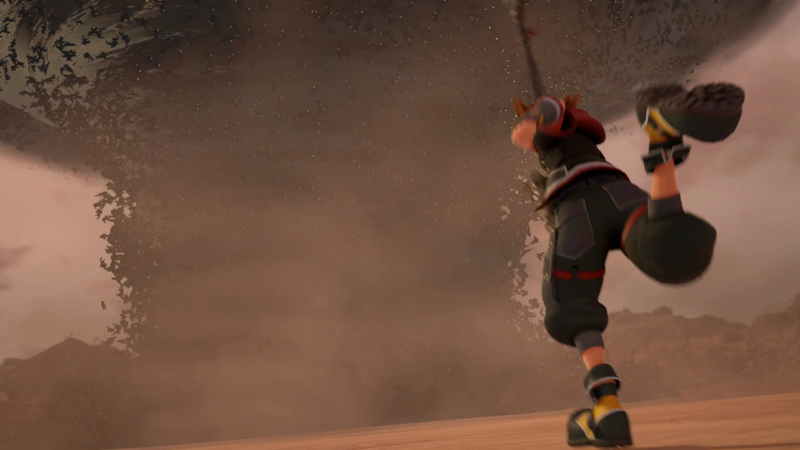 In addition, without a counter equipped enemies can put Sora into a stun lock that prevents him from attacking. Traveling through worlds still requires the use of the Gummi Ship, which has been improved on. The space combat resembles Star Fox or Halo: Reach with sharp controls and a focus on old-world exploration instead of a linear rail shooter. Players can choose from a series of pre-built ships, which must be purchased or create their own. You're expected to earn new ships through a leveling system by defeating bosses and collecting treasure within these space-traveling levels. 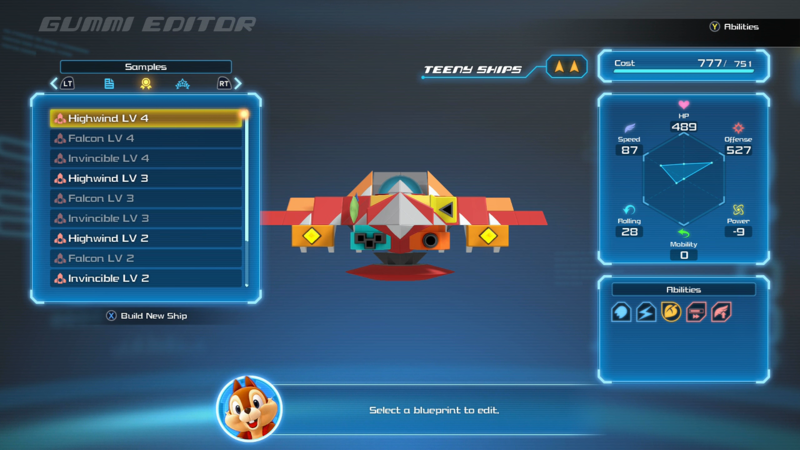 Since leveling the Gummi ship is limited to these segments players will need to dedicate more time here than in previous games but it's much more fleshed out here than other games in the franchise. What brings everything together is the outstanding soundtrack, buttery smooth animation, and jaw-dropping graphics. Every world, landscape, and character has been polished with intricate details while also being loyal to the source material. This extends to even the smaller things such as the command menu, character portraits, and the keyblades transformations. Complementing everything is a fitting score of musical tracks that combine both past and newly composed music for this outstanding adventure. Each world has also been populated with more characters. In past games, most of the worlds would be barren of any people, but here you get to see people at the market or being attacked by hostile enemies. Square Enix has also put more emphasis on interacting with the world, with Sora able to perform and speak with the people around him. They actually feel like towns. However, it can be annoying to navigate these areas since the game doesn't provide a constant waypoint and you cannot warp to the world map unless you're at a save point. After completing a world an option to warp to different locations in a world or head into the world map should've been provided at any time. Kingdom Hearts III provides an outstanding journey full of exciting worlds to discover, intense boss battles, and memorable moments. The combat is a breathtaking combination of movement and exceptional encounters with creatures both big and small that is heightened thanks to an outstanding soundtrack. The narrative will have many confused unless they're willing to dedicate hours in watching and researching information but those who dedicate themselves to the story will find is much more rewarding towards the end. 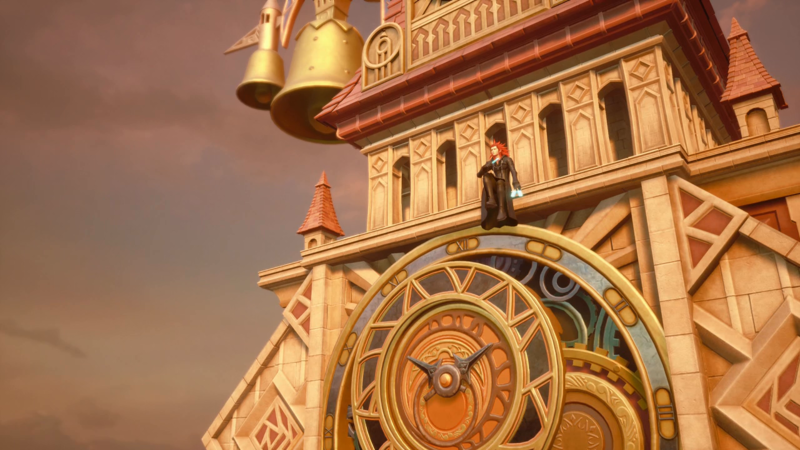 Sora's adventure may have taken a decade to come to an end but after playing through Kingdom Hearts III it's clear why it took so long. You cannot rush greatness.